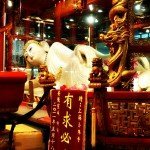 The Confucius Temple is one of the most fascinating places to visit in Shanghai. But what’s its purpose and raison d’être? Worshiping in Shanghai can assume very different facets. For a start, there is this sanctuary devoted to Confucius. And although his philosophy is truly to be admired and studied, he’s not really a god. However, in China, far from being a clerical state, they use the word “temple” with a wider meaning. 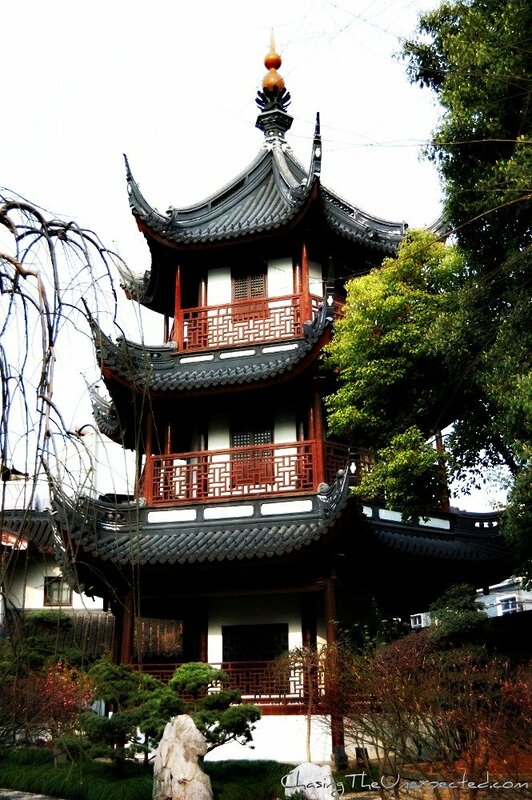 The beautiful Confucius Temple situated in Wen Miao Road (Wen Miao Lu, 文庙路), in Huangpu District, not far from Xintiandi, was founded with the purpose of studying Confucius philosophy. Moved to four different locations, in 1855 it finally ended up where it is now. The temple is very big. Each of its areas is devoted to different activities: worshiping, studying and to completely immerse in nature surrounded by the typical Chinese gardening style. In China everything is possible. So also every religion is possible, as long as it stays such, a religion, without the possibility to interfere in political matters. The most widespread creed is Buddhism, and the country is studded with temples. Confucius’ philosophy has had, and still has, a great influence in Chinese mentality and civilization. I’m a big fan of Confucius myself. I think his theories of a constant contact with nature are among the most powerful and important men can follow in order to respect and preserve the planet. Hence a visit to a sanctuary devoted to him was for me absolutely a pleasure. Both during the Taiping Rebellion in the mid-19th century and the ten years of Cultural Revolution (1966-76), the Confucian Temple was heavily damaged. Its reconstruction was finalized and made official in 1999, in honor of the sage’s 2550th birthday. After passing the main gate, visitors find themselves in a wide courtyard before the temple itself. 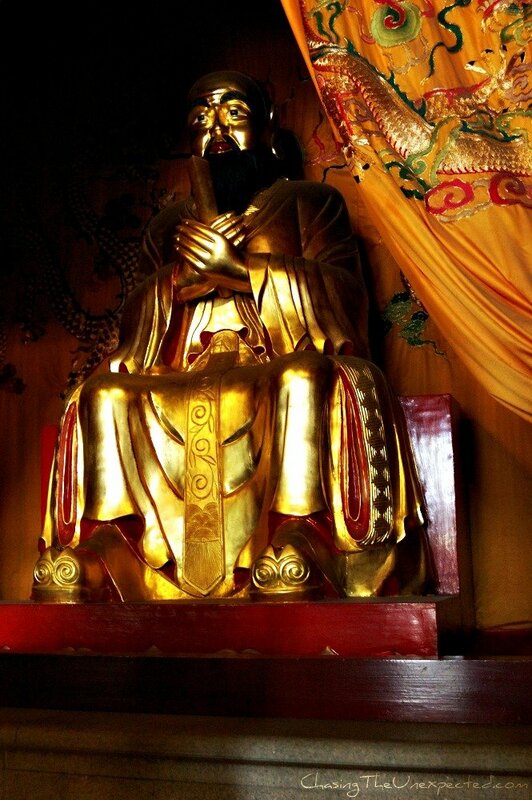 At the entrance of the temple there is a big statue of Confucius along with the small area where they perform functions such daily prayers, special festivities, funerals or remembrance celebrations. Inside, they decorated it with ancient (or ancient-looking) drums and traditional Chinese characters cover the walls. The worship area is just in front of another Confucius statue, with the typical cushion for the worshipers to kneel. It doesn’t really look like the typical Buddhist temple. I found it more modest, and definitely not with all the amount of flowers, fruits and food in general I saw in other Chinese temples like in ZhouZhuang water town. In fact, it looks more like a place for studying. Facing the main temple, on your right hand-side you will see the entrance to the part devoted to scholars and researchers, an area with the unmissable lake and pagoda to inspire peace and tranquility. I loved browsing around the different halls and pavilions, stumbling on statues, carvings, natural rocks in proper Chinese style, and traditional paintings. I would recommend without hesitation a visit to the Confucian Temple to whoever goes to Shanghai. It might be a little hard to find as Wen Miao Road is a very small street off the bigger South Xizang Road (Xi Zang Nan Lu, 西藏南路), but definitely worth it. The nearest metro station is Loaximen (老西门) on line 10 and it’s in a very central and vibrant area. I paid 5 Chinese yuan for the entry because I had a student card, otherwise it’s 10 yuan for everybody, around 1 GBP or 1.5 USD, more like an offering rather than a proper entrance fee. Finalement je peux laisser le commentaire: encore bravo! I was in Shanghai earlier this year and missed this. It’s such a big city, and there’s so much to do without enough time. I guess that means I’ll have to go back. The photos remind me a little of the gardens in Suzhou. 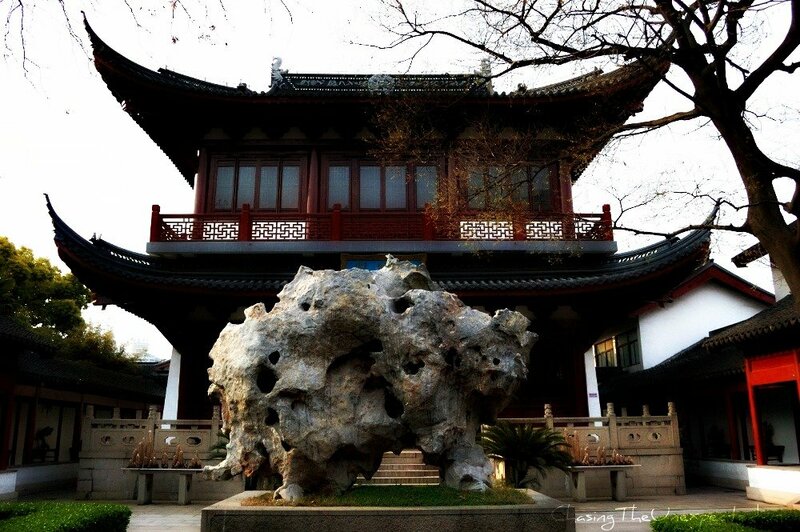 Yes, Chinese gardening style is similar all over the country, it always comes from their belief that rocks are a gift from nature, so they are left as they are found. I spent three weeks in Shanghai and missed this. This reminds me of how green that area is, and how colorful the buildings! After reading your article, I would definitely make it a point to visit the Confucian Temple. Your article is really very interesting about Confucius and historical background. The temple looks quite beautiful, too. What a nice little treasure you found here. Its certainly looks more peaceful and serene than the Shanghai I experienced. I especially love the photo of the traditional temple with the beautiful garden contrasted by the taller high rises. Its very Shanghai. 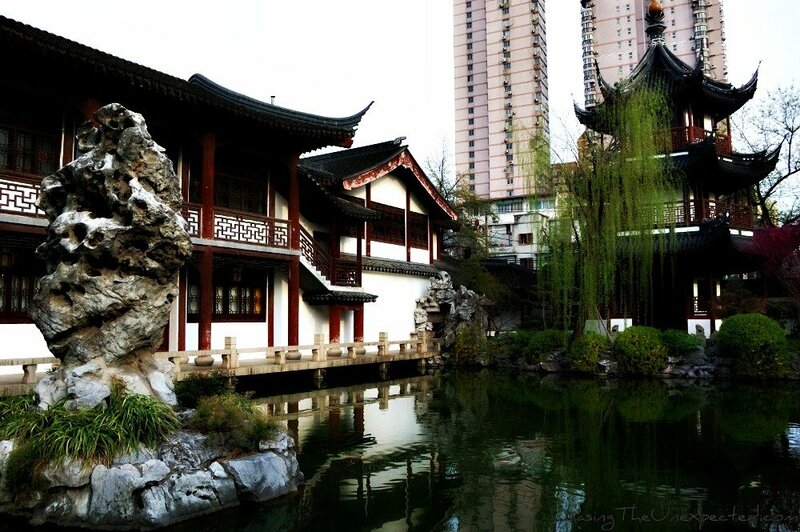 True, also in Jing’An Temple you can see the contrast between old and new very well. The Confucian Temple is very peaceful, in line with the sage’s philosophy, which I find very fascinating. From the pictures it looks so beautiful and tranquil. I have always found Confucius very interesting. I think I might add going here to my bucket list. Great article. I too like Confucius, by all means visit his temple if you go to Shanghai. There is confucian temple because originally it was a religion. He is not God, but he believed in monotheistic God called Tian (Heaven), and for many he is the teacher of Heaven’s ways…a messenger, you might say. Abraham was not God, but holy for jews. Mohammed was not God, but holy for muslims. Kong Fuzi taught us the wisdom of Heaven, and under his religous teachings, implemented later, great governance was achieved. That made him sacred. people need to stop considering confucianism simply a philosophy. i am a religious confucian and it annoys me that westerners don’t understand it really isn’t just philosphy. Thanks for stopping by and clarifying things up, although I don’t think comparison with Abraham and Mohammad is appropriate, I think they are quite different concepts. Also, since I’ve always considered Confucianism a philosophy, one of my very favorite I must say, I’ve asked Chinese people when I was in China and they told me it’s a philosophy, that’s probably the source of my confusion. I thought I could compare it to Buddhism, which many people think it’s a religion but when I asked Buddhist monks in Thailand just last week they confirmed that Buddhism is not a religion but a way of life.